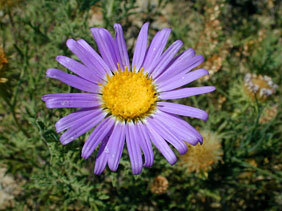 Also Called: Tansy-leaf aster, tahoka daisy. Stems: Erect, solitary or branched, glandular-hairy. Leaves: Alternate, densely crowded, short-stalked to sessile, 1 to 3 inches long, to 1 inch wide, pinnately divided 1-2 times into linear to oblong-lanceolate segments; tips with small, hard spines. Inflorescences: Solitary heads, 1 to 2 inches wide, terminal; bracts long, narrow, bases paper-like, tips green, spreading or curving back. Flowers: Ray florets 15-25, bluish purple; disk florets numerous, yellow. Fruits: Achenes, appressed-hairy, tipped with stiff bristles, enclosing small seed. Habitat: Open, dry, disturbed areas and roadsides, most abundant on sandy soils. Distribution: West third of Kansas. Uses: The Navajo used the dried roots to reduce nasal congestion and as a sneeze-inducing snuff. Comments: Mature tansy aster plants appear bushy. Though closely related to the asters, it is set apart by its spine-tipped leaves. The common name "Tahoka daisy" began to be used when seeds were collected for commercial use in the area around Tahoka, Texas.